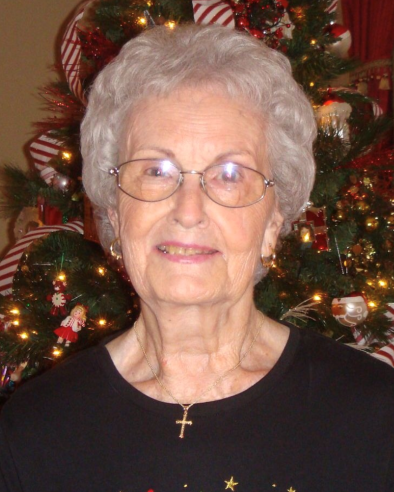 Loyce Lee Kemplay, 95, of Baytown, passed away August 22, 2018, in Baytown, Texas. She was born in Chirino, Texas, April 30, 1923, to Carl and Beulah Phillips. Raised in Houston, Texas, she graduated from Milby High School. In 1940 she married Thomas Raymond Kemplay, and they moved to Goose Creek where he opened the first Goodrich store in the Tri-Cities. They had three children, and she was a devoted wife and mother, never missing one of her children’s activities. Over the years she enjoyed working as a Pink Lady at Gulf Coast Hospital, teaching Sunday School and MYF at Cedar Bayou United Methodist Church, volunteering her time as a homeroom mother, and leading a Brownie and Girl Scout troop. In her later years she served in the children’s department at Second Baptist Church where she wrote birthday cards and helped prepare material for the Sunday services. Loyce is preceded in death by her parents, husbands T.R. Kemplay and John Adamek, son Jerry Kemplay, son-in-law Tommy Jones, two sisters, and four brothers. She is survived by her daughter Sandra Jones, daughter Peggy and husband Dan Cervenka, grandchildren Keith Kemplay and wife Michele, Kevin Jones and wife Nisha, Staci Woods and husband Don, Donna Zinsmeyer, and Cynda Brown, thirteen great-grandchildren Haley Brown, Jordan Brown, Amanda Woods, Davis Woods, Annie Jones, Ryan Jones, Maegan Jones, Rachel Zinsmeyer, Clark Zinsmeyer, Kayla Zinsmeyer, Brandon Ervin, Trevor Ervin, Alex Ervin, daughter-in-law Lynn Kemplay, and step daughter Debra and husband James Gardner. Special thanks to the care givers from Heart to Heart Hospice for their support during this time. A graveside service will be held at 11:00 a.m., Saturday, August 25, 2018, with Mark Stafford officiating, at the Cedarcrest Cemetery in Baytown.